When I learned that external objects could be controlled through the standard parallel port on my PC, it opened a whole new world of computer applications to me. 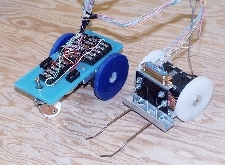 It allowed me to combine many of my interests into a common project: mechanical design and construction, electronics, and computer programming. My first attempts were, well, primitive. Getting an light emitting diode to light up under software control was quite an accomplishment. Moving on to having a relay energize creating many possibilities. The simplicity of the parallel port's ability to send and receive digital data keep the electronics parts count down and well as simplifying the software design. These projects also make good use of older computers, such as a 486 through Pentium 3 machines, running DOS or Windows 98. Newer machines will yield different results because of they way they address the parallel port.